We still have a lot of snow in the hills of western Massachusetts, but I know spring is on its way. The sun shines in on my bed a little earlier every morning, delighting my cat Lorelei Lee. (I don’t have to look out the window or feel the sunlight. I can identify the exact moment the rays land on the quilt because I suddenly hear purring.) Of course, losing the hour of sleep this past weekend was a little hard on both Lorelei and me, but we love having more light in the evening. Maple syrup taps have begun appearing on neighborhood trees, and sugarhouses are starting to boil down the sap to make New England’s best known elixir. Best of all, new baby animals are making their way into the world. 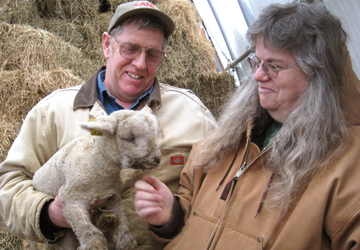 Erwin and Linda Reynolds in Charlemont reported the other day that they had THIRTY-ONE little lambs at their Erlin Farm! Naturally, my mother and I had to pay them a visit. I think my mother may have been more excited to see our friends than the lambs. Erwin and Linda embody the extended meanings of the terms shepherding (guidance) and animal husbandry (love). They have within them huge stores of common sense and heart. My mother is as sensitive to those qualities as the lambs seemed to be. The lambs we saw at Erlin varied in age between six days and five weeks. The oldest were just learning to use their little knees to leap into the air. One would suddenly execute an awkward jump on all fours; then a couple of others would try and ALMOST manage. I’m sure within a day or two many will be airborne. My mother and I fell especially in love with one of Erwin and Linda’s “bottle babies,” Bandit. Erwin explained that sometimes the ewes have too many lambs to feed or just don’t come up with enough milk. At that point, Erwin and Linda take over with formula. They have take extra care of the bottle babies since these lambs don’t get the natural immunities that come from drinking mother’s milk. Bandit looked pretty happy and healthy—and utterly darling. I’m hoping she gets to be a mother next year instead of being turned into lamb chops. Erwin and Linda gave me a bunch of recipes from the American Lamb Board, some of which I’m sure will make their way into these pages soon. 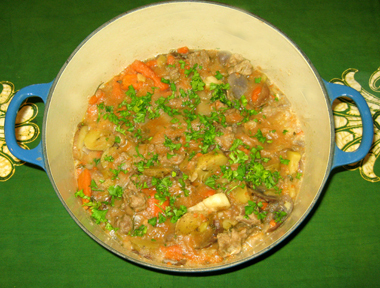 Meanwhile, in honor of spring—and Saint Patrick!—here is a recipe for lamb stew. The recipe gives the potatoes and carrots maximum flavor by mixing them in with the lamb from the very beginning of the cooking. Its drawback is that by the time the stew is done the pieces of potato and carrot have become very small. If you like, you may wait until after the first hour to add them to the stew pot. They will have more integrity that way. I like a crazy mixed-up stew so this method suits me just fine. First, roast the garlic. (If you are disinclined to roast, you may skip this step and chop up a couple of cloves of raw garlic for the stew instead. I think the roasting is rather fun.) Preheat the oven to 400 degrees. Pull the outside skin off the head of garlic, but leave the individual skins on the garlic cloves. Cut off the tips of the garlic cloves. (See photo.) Place the garlic head in a small baking dish. (An ovenproof ramekin does nicely.) Drizzle oil all over the exposed parts of the garlic, using your fingers to make sure the oil touches all the visible garlic. Sprinkle salt and pepper overall. Cover the baking dish with aluminum foil. Bake the garlic until it feels soft, about 30 to 40 minutes. Allow it to cool until you can touch it; then squeeze the individual cloves out of their skins and into a bowl. Mash the garlic with a fork. Set it aside while you prepare the lamb. Trim off any excess fat you can from the lamb, and cut it into small chunks. Place about 2/3 of the potatoes in the bottom of a Dutch oven. Arrange the onions and garlic over the potatoes; then put the carrots on top of the onions and garlic. Place the meat on top. Sprinkle at least half of the parsley and all of the rosemary on the meat, plus the salt and pepper. Top with the remaining potatoes. Pour the stock over all, and place the Dutch oven on the stove top. When it boils, turn it down and cover it. Simmer the stew for 2 hours, stirring occasionally to keep the food from sticking to the pan and adding more stock if necessary. Just before serving sprinkle the remaining parsley on top of the stew to give a hint of fresh green. This entry was posted on Monday, March 9th, 2009 at 4:05 am	and is filed under Holiday Foods, Meat and Poultry. You can follow any responses to this entry through the RSS 2.0 feed. You can leave a response, or trackback from your own site. Memories! 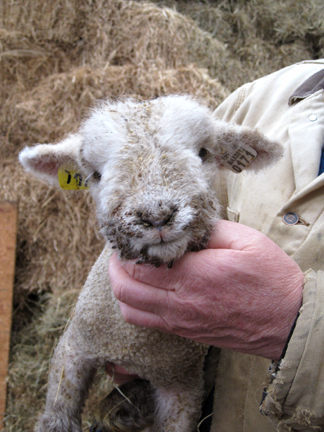 I spent a few childhood years helping tend sheep, and lambing season was my favorite. My dad had a little 4 acre plot and a couple of sheep I took care of, but the family across from us in the country outside Lexington, Virginia–the Womeldorf’s, two brothers and two sisters–had a big farm, grew cattle and sheep and all manner of other things, and I was lucky to have been quasi-adopted into their family as #1 child helper. So I got to help with lambing, shearing, even butchering (not my favorite thing), and in the summer, helped bring in the hay, hauling bales of hay out of the baler and onto the hay wagon. (That builds boy muscle, I’ll tell you!) But the lambs were my favorite, with the exact leaping and gamboling you describe. These days, I have a modest problem eating lambs I have known, but then again, I don’t know so many any more. My introduction–or reintroduction–to lamb stew was one weekend in my young adult life when my then wife and I went one January with friends to the Adirondack camp of one of their families, on the shores of a very frozen Saranac Lake. It never got above 10 below that weekend, but nevertheless, we skied all day on the frozen lake and in the nearby woods, then came in a night and cooked and ate and drank. The lamb stew was a great and memorable triumph at the end of an exhilarating day –but it included turnips, which gives another twist entirely to the stew. Now I make (as is my wont) many varieties of stewed lamb, and I like this one for its straight-forwardness. I wonder couldn’t you have your carrots and potatoes and eat them too if you were to split them up, layering some in at the beginning, and then adding the balance later? Or is that going too far!? I love the Erlin farm pics…and especially that little bottle fed creature! What a great blog! Didn’t our grandfather have a pet lamb once that ended up as Easter dinner? Which apparently put him off of lamb for the rest of his life. 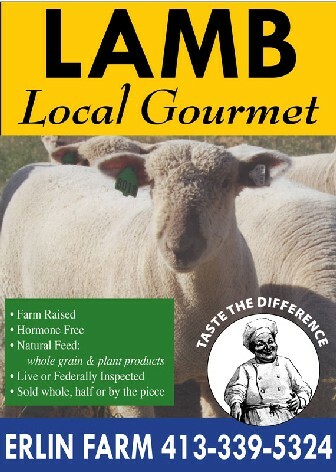 I like lamb and mainly have it grilled (so Mardi doesn’t have to get the smell out of the kitchen), but it is a different taste and some people never get accustomed to it. I made your recipe the other night and it was wonderful! I loved how it was so easy to put together but I did cheat on the garlic. I didn’t roast it. I just threw in a whole bunch of chopped up garlic. I also added the carrots and potatoes later. Once everything came to a boil, I put the covered pot in a 350 oven for 2 hours (added the veggies of course after the first hout). It’s less maintenance of the dish if its in the oven rather than the stove top! Mirepoix! Sounds like a future post to me. Want to do it? Many thanks for the Irish lamb stew recipe. Merri and I made the stew with “bits and pieces” of a lamb from Reynolds farm here in Charlemont. It was marvelous.